Emily performed on Show 310, recorded in Aspen, CO, on July 12, 2015, at age 16. Emily Shehi, violin, 16, is from Olathe, Kansas and currently studies with Noah Geller, Concertmaster of the Kansas City Symphony. She has performed as soloist in concert with the Kansas City Symphony as a winner of their annual concerto competition under the baton of Michael Stern. 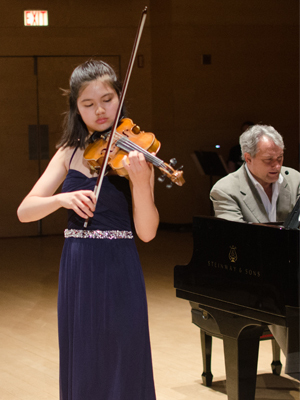 Emily received third prize at the 2015 Irving M. Klein International String Competition. She has attended Music@Menlo, Aspen Music Festival and School, Heifetz International Music Institute, Starling-DeLay Symposium on Violin Studies and 2014 New York String Orchestra Seminar. She has continuously committed her time performing for senior residents at retirement center since age 10. Outside of music, Emily enjoys photography and reading.